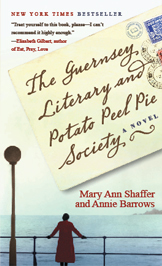 The Guernsey Literary and Potato Peel Pie Society » Virtual book club, next question! « Thinking of visiting Guernsey? This entry was posted on Monday, November 9th, 2009 at 1:23 pm	and is filed under Uncategorized. You can follow any responses to this entry through the RSS 2.0 feed. You can leave a response, or trackback from your own site. i would love going for a trip to Guernsey. the book really made me imagine it as a really beautiful island. it really is! i’ve just googled it. i’ll be starting my study in Portsmouth fall 2010 and i really wish there’s a way to go to Guernsey for a visit. Those are very loaded questions! But after reading the book, most absolutely I would want to visit guernsey one day! Books have inspired me to go visit the places that they’re talking about. I’m currently reading ‘Snow’ by Orhan Pamuk, and it makes me want to visit the small town he wrote about. It’s all about Islands! I’ve been to Prince Edward Island 9 times and become an L.M. Montgomery research scholar because of her books, but mostly because of her journals. I have also stayed at Sissinghurst in Kent to enjoy the environs of Vita Sackville-West for several days. I love to visit the sites of literature — if I can afford it. Guernsey is on the list now after reading this beautifully crafted book! Part of my heart is now residing in Guernsey after finishing this wonderful book last night. I want to go to Juliet and Dawsey’s wedding and watch Kit throw rose petals….My imagination is brimming. I feel like I could close my eyes, jump in, and become part of the story- Like Alice in Wonderland. But what I love is that the people in this book are real and will of course live on in everyone’s hearts who read “The Guernsey Literary and Potato Peel Pie Society.” Are there any groups planning a trip that are looking for people who love to read to join them? I am also a writer. Maybe Annie Barrows would like to lead such a group? I´ve visited John Keats´house in north London and his grave in Rome, as well as the museum dedicated to him and Shelly. I´ve been to Skadarlia in Belgarde which inspired bohemian and romantic poetry in the last century and before. I´ve neen to Ljubojno in Macedonia and seen Metodia Fotev´s house and the small church St Atanas he mentiones in his novels. Other places, too. I have just finished “The Guernsey Literary and Potatoe Peel Pie Society” and it ended far too soon I wanted it to go on forever! This has been one of those books (and there aren’t that many) which made we want to move to the place about which it speaks. I guess since I am too old now (75) to move to Guernsey I wwould have to be satisfied with a visit or at the very least just dreams of a visit. Of course I should want to meet Juliet and Dawsey, and of course Kit, Isola, Amelia and all of the Society. Not Mark though!! But of course Sidney. Please Mary Ann and Annie write more!! I haven’t finished reading this book yet, but I already want to visit Guernsey. In fact, I just mentioned it to my friend at dinner earlier this evening. Yes, many books have inspired me to visit Paris more. This book really got me thinking of make a special trip to Guernsey. My in-laws live on the Isle of Wight off the coast of England so it can’t be more than a hop skip and a jump to Guernsey. I will be making plans. I don’t know what rock I have been living under but I picked this book up just this week and couldn’t put it down. Simply loved it and am referring it to everyone I know. I am reading The Guernsey Literary and Potato Peel Pie Society book and have been looking at Guernsey’s tourism website. Would love to visit Guernsey! In fact, I had already been looking at info on Guernsey when I spied the book at my local library. Guernsey in the title is what caught my attention! There are several places I would love to visit and the main reason is because I read about them in books. First is Scotland because of Diana Gabaldon’s Outlander series. Then comes Cornwall, England because of Rosamunde Pilcher’s books. I would also like to visit Alice Springs in Australia because of a book I read long ago. I think it is awesome that you had a contest for visiting Guernsey! I just found this website because of searching for info on the book and the authors. I am a Jersey woman and know the island very well. It is beautiful, more conservative than Jersey. It is important to mention that when the Germans arrived, July 1940 they cut the cable to England, so all communication with the civilized world, even Guernsey, ceased for five years. I live in the United States (Arizona) now but always return to the islands. Last visit was September 2009. I am frequently in invited to speak at the many Book Clubs around here. The book is delightful so I am happy to do so. The next meeting will be March 8. My Guernsey friends are amused that I, as a Jersey woman , promote Guernsey! I am an American citizen but I shall always be proud to have been born in the Channel Islands. At the last meeting I attended one of the ladies had visited Guernsey two years ago. She loved it! Sheila Le Sueur. I find it interesting that my recent comment on the excellent read in The Guernsey Literary and Potato Peel society have been misinterpreted. I loved the book. Read it twice and have recommened it to many others. Having “survived ” the German Occupation in Jersey I can validate many points of life living under German Occupation. Please remove my name from this website. Thank you. Sheila Le Sueur.